The Coalition for Evidence-based Education (CEBE) is an alliance of researchers, policy makers and practitioners who are interested in improving the way research evidence is used, and exchanged, across the sector. Since its initiation in 2009, CEBE has successfully engaged with leading advocates for evidence-based reform and a wide range of stakeholders across education, including government, policy-makers, teacher trainers, researchers, practitioner groups and teaching professionals. We are entering a period of more local responsibility in education, with current policy moves towards decentralisation. In this environment, practitioners will more than ever require accurate, useful and accessible information on ‘what works’ for learners, in what contexts and at what costs. Nevertheless, despite an increasing body of useful evidence in education, and many notable initiatives to improve knowledge exchange, there are still significant challenges in linking research evidence to widespread decision-making. In the UK today there are dozens of independent organisations and initiatives that could describe themselves as working in delivering ‘evidence-based education’, in addition to teaching professionals. 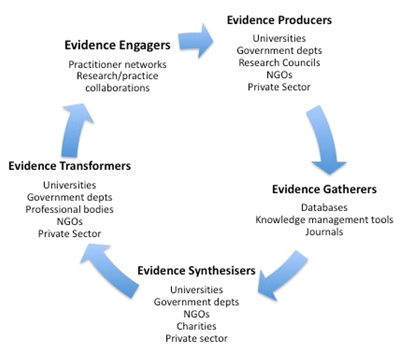 This includes research groups that produce evidence (academic, government and NGOs etc), review groups that synthesise evidence, brokers that interpret evidence, and a multitude of different ways of accessing and engaging with evidence. These organisations work across different fields (policy, teaching/learning, social and emotional learning etc), different educational phases (primary, secondary and FE), and adopt a range of different approaches and methodologies. practical initiatives to identify, and fill, gaps in the current infrastructure. CEBE has been developed collaboratively to enable it to make progress on both fronts. The intention is to amplify and link up, not replace, current activity, and so scale up evidence-based policy and practice in the UK.